Forgotten Tech The transistor, the ubiquitous building block of all electronic circuits, will be 60 years old on Sunday. 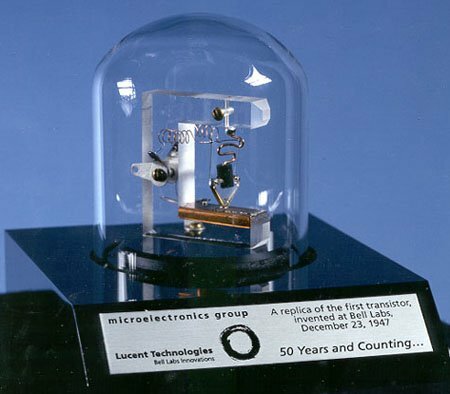 The device is jointly credited to William Shockley (1910-1989), John Bardeen (1908-1991) and Walter Brattain (1902-1987), and it was Bardeen and Brattain who made the first working point-contact transistor on 16 December 1947. The name wasn't coined until the following year. Bell Labs employee John R Pierce (1910-2002) thought up the moniker, and in May 1948 his colleagues, who'd been presented with a list of suggestions, opted for his. "This is an abbreviated combination of the words 'transconductance' or 'transfer', and 'varistor'," Bell Labs' voting paper put it at the time. The team's work goes back to the late-1930s, but the real work didn't begin until after the end of World War II. Shockley proposed a field-effect transistor design that would be made out of thin slices of different semiconductors, including silicon, sandwiched together. Unfortunately, he wasn't able to get this design to work the way his maths anticipated, and so Bardeen and Brattain chose to investigate the simpler, surface-effect point-contact design. The two men produced the first point-contact transistor by attaching two gold-foil point contacts to a piece of germanium, itself mounted on a metal base. The gold sheets were kept apart with a wedge of plastic. Originally a single sheet of gold, the very closely-sited contacts were made by slicing the sheet at the apex of the triangle. This time it worked, and Bardeen and Brattain were able to extend their apparatus with circuitry able to amplify sound signals, much to the delight of their Bell Labs bosses. The company would go on to put the point-contact transistor into limited production, announcing the device to the public on 1 July 1948. By then, Shockley had already developed an alternative design and the point-contact device's successor: the bipolar junction transistor. His invention, built and tested in January 1948, made for a more compact design and proved, in time, to be easier to manufacture than the bulky point-contact transistor. It went on to become the basis for all the transistors used in electronics products right up until the broad use of Complementary metal–oxide–semiconductor (CMOS) technology in the late 1960s following the discovery of the MOS by Bell Labs' John Atalla and Dawon Kahng in 1959, though the patent wasn't applied for until 31 May 1960 - and granted on 27 August 1963.